FEB190485 - Batman is on a desperate hunt through Gotham City, tracking down the dark version of himself known as the Grim Knight. 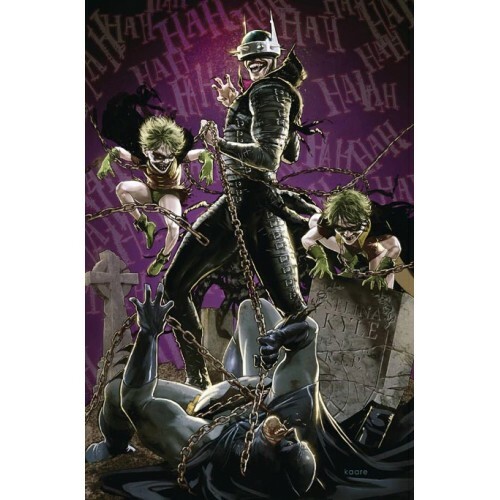 But the serum Batman's been self-administering has started to transform his mind, making him into something much darker...something amoral…something like the Batman Who Laughs-and he's starting to lose his grip on reality. Toeing the line between vengeance and justice, Batman must struggle to keep his moral code as the Grim Knight gains control of the Batcave, sending all of his vehicles and weapons on a collision course with Gotham City. 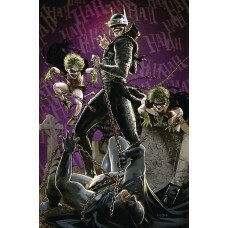 The Grim Knight, the Batman Who Laughs, even allies like Jim Gordon and his son force Batman to pull the trigger…and activate the Last Laugh. Will Batman be the savior of Gotham City once more? Or is he the kill shot?